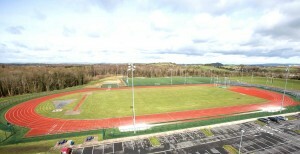 Opened in 2005 and located just 1 km from Ennis town centre, the Sports and Amenity Park at Lees Road is set in 134 acres of feature-rich, biodiverse woodland and parkland. The Park was renamed in memory of Sgt. John O’Sullivan, former President of Clare Community Games on 19th May 2017. The Park is a busy hub for the people of Ennis and Clare whether they are serious athletes, participating in team games, enjoying a leisurely stroll or watching their children in the playground. 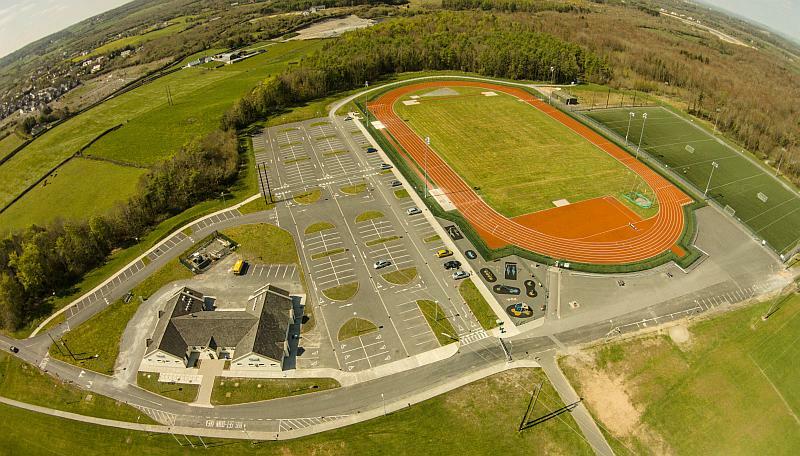 Facilities include four conventional playing pitches, large all-weather pitch, skateboard park, active trail, athletics track, cross country running tracks, woodland walking trails and a community orchard. These are served by eight dressing rooms and ample car/coach parking. All pitches, athletics track must be pre-booked. 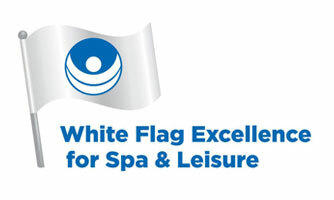 The other facilities are free and do not require booking. Please be conscious of the Park’s closing times, especially if you arrive by vehicle, as the main gate is locked at closing time. 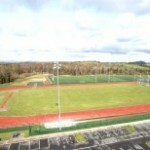 Sports catered for include Gaelic football, hurling, hockey, camogie, cricket, soccer and rugby. Pitches are available from as little as €20 per hour depending on time (peak/off-peak) and age group (adult/juvenile teams). For all current rates or to book the grass pitches or all/part of the all-weather pitch, contact us on 065 – 6821604 or use the Enquiry Form. There are full track and field training and competitive facilities. The 400 metre synthetic running track includes a steeplechase water jump and is complemented by infield infrastructure such as shot putt/hammer cage, javelin area, long jump and high jump areas. The cross country training track features a variety of terrain and gradient, offering challenge and enjoyment in equal measure. 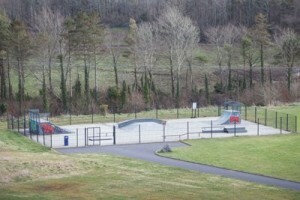 County Clare’s only specifically designed and purpose built skateboard park is located on the opposite side of the football pitches to the dressing rooms. It was opened in 2007 by legendary US professional skateboarder Rodney Jones who was very enthusiastic about this new dimension to Lees Road Sports and Amenity Park. Designed to the highest safety standard the skateboard park provides enjoyment and challenges to skateboarders of all ages and ability. In the interests of safety, helmets and protective clothing must be worn by all skateboarders. 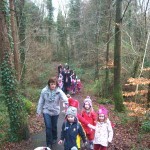 Within the 134 acres, there are a variety of marked looped walks and woodland trails. Information boards in the car park give details of the flora and fauna in the Park. Please remember that the trails are suitable as daytime walks only and be conscious of the Park’s closing times. Failure to keep your dog under control (on a lead) is an offence under the Control of Dogs Act, 1986, and failure to clean up after your dog is an offence under the Litter Pollution Act, 1997. Both acts provide for a fine or prosecution in respect of offences. In June 2010 a playground was added to this facility. 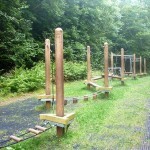 This playground is aimed at the younger age group with elements of the equipment suitable for the 8 – 12 age category. A variety of equipment is included in the project including junior and senior swings, ladder slide and pony and elephant springers. The needs of children with disabilities have also been incorporated into the design. This playground is a further addition to the range of amenities at the Lees Road Sports and Amenity Park. In particular it provides a great source of enjoyment for those under eight and is well utilised by the younger population. The location of this playground within the Lees Road facility is an excellent example of an integrated approach to providing recreational facilities. 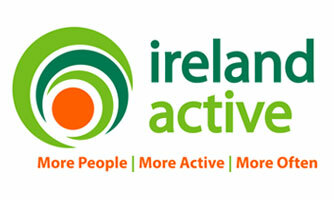 Lees Road Sports and Amenity Park has added a new active trail. 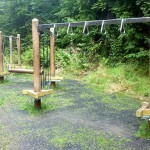 The addition of the active trail equipment supplements and enhances the facilities already available in the park. This outdoor equipment incorporates exercise activities for all abilities. It can be used to aid rehabilitation from injury or ill health, as well as taking your fitness to the next level. The importance of exercise for all age groups cannot be emphasised enough and this active trail equipment ensures that the more mature child also benefits from regular activity. The active trail offers exciting and challenging climbing, rope and balance landscapes, which are fun for all and which get everyone moving. There are a total of 16 elements available in differing degrees of difficulties, providing a fitting challenge for children, teenagers and adults alike. The active trail equipment encourages high jump and long jump, physical exertion, climbing to great heights, swaying, rolling, turning and tumbling, new and exciting adventures together with personal growth and development. This equipment meets all individual requirements and it blends harmoniously into the natural surroundings in Lees Road. 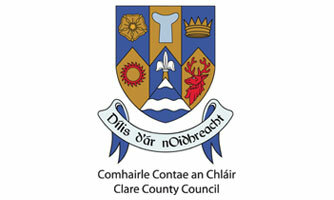 The Lees Road Sports and Amenity Park is a joint development by Clare County Council and Ennis Town Council, with financial assistance provided by the Sports Capital Grants Scheme.